Jenkintown, PA (October 25, 2009)  The Ukrainian Educational and Cultural Center announced today that Mrs. Orysia Hewka will leave as UECC's long serving executive director on October 31st, 2009. Mrs. Hewka announced her plans to the UECC's Board of Directors earlier this month. Mrs. Hewka, will assist with the transition as the UECC begins its search for a new Executuve Director. Ms. Hewka's work for the Center began with its founding in 1980, when she was elected to the UECC Board of Directors. Later Ms. Hewka served as a volunteer Executive Director and for the last 20 years as a paid Executive Director. 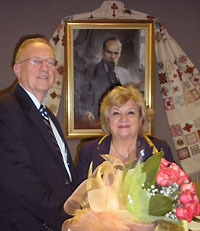 Her monumental commitment to the UECC and the Ukrainian community of the Greater Philadelphia area showed in her work. Among her many accomplishments throughout the years, Mrs. Hewka passionately organized demonstrations in defense of Ukrainians, organized events to raise awareness of Ukrainians and Ukraine, wrote over 35 grants for the UECC, chaired numerous fundraising campaigns, and served the Ukrainian community through the UECC Radio program and Social Services. "I want to thank Orysia for her terrific contribution and commitment to the UECC for all of these years," said Borys Pawluk, UECC President. "Orysia has diligently served the UECC and Ukrainian Community for many years and we all wish her the best in her future endeavors. Mnohaya! Mnohaya Lita!"